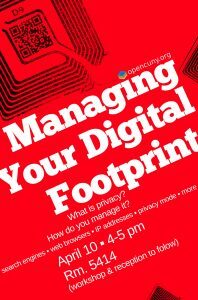 This OpenCUNY event titled Managing Your Digital Footprint may be of interest to you and your networks – share widely please! WHAT: In this presentation we’ll examine the digital footprint you leave behind whenever you connect to the Internet and suggest simple tools for managing that footprint. We will discuss search engines, web browsers and add-ons, IP-addresses, Incognito/Privacy mode, and more. 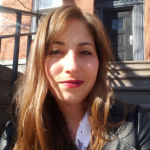 This topic was also posted in: Data For Public Good, Digital Humanities Initiative, Digital Praxis Seminar 2017-2018, Futures Initiative, Digital Initiatives at the CUNY Graduate Center, GC Digital Research Institute - January 2019, GC Digital Research Institute January 2018, Reclaim Hosting Users Group, GC Digital Fellows.